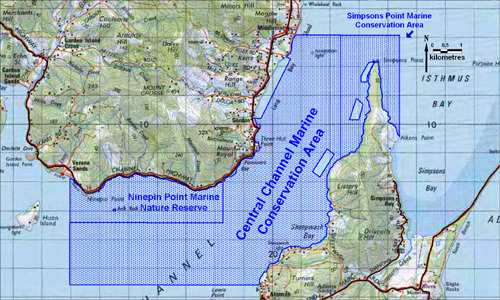 The Central Channel Marine Conservation Area occupies 3,443 hectares within the D'Entrecasteaux Channel between mainland Tasmania and South Bruny Island. The reserve contains high levels of biodiversity and natural productivity. There is a rich diversity of seaweeds and seagrasses, as well as sediment and current communities. The reserve contains habitats for several threatened species including the seastar (Smilasterias tasmaniae), the Gunns screw shell (Gazameda gunnii) and live-bearing seastar (Patiriella vivipara) and the spotted handfish (Brachionichthys hirsutus). The reserve also provides important habitat for scallops and a nursery and refuge area for sharks.